My parents still live in the house where I grew up, and it seems like every time I visit, they have a new vegetable planted in the garden or a new ornament adorning the deck. It was no surprise that I noticed a bright-colored, unfamiliar bird feeder hanging from their back fence during one of my stops. “Did you see my new finch feeder?” my mom asked. In all my days on their property, I had never, ever seen a finch in their yard. Doves? Sure. Hummingbirds? Plenty. 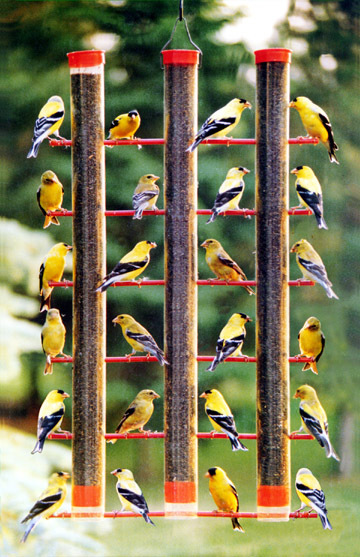 Finches? Not so much. “Mom, I don’t think there are any finches around here,” I said, gazing at the unoccupied seed dispenser. It was as though she knew beyond a doubt that, one day, her feeder would be covered in birds. A few weeks later, I returned for dinner and immediately detected a flurry of chirping as I wandered onto the deck. The feeder was crawling with finches. Had my mom manifested their arrival with her positive feelings? Had her knowing outlook and invitation of food been enough to attract them right into her backyard? There’s no way to tell for sure, but the bottom line is that she got her birds. By acting as thought her yard was already filled with finches, she had drawn them into existence. I've mentioned the idea of "acting as though" in a couple other posts here because it's one of the most paramount principles of manifesting. I know, it's all very Field of Dreams, "if you build it, they will come." But it works! What would you start doing differently if you were acting as though your perfect life already existed? Would you treat yourself better? Engage in different activities? Laugh more? Why not start with the positive feelings and joyful actions and let your dream align with YOU? You could end up with an entire flock of fulfilled fantasies right in your backyard!